Dr. Rupal Kothari, DO is a Doctor primarily located in Malvern, PA, with another office in Havertown, PA. She has 22 years of experience. Her specialties include Gastroenterology and Internal Medicine. She speaks English. The overall average patient rating of Dr. Rupal Kothari is Great. Dr. Rupal Kothari has been rated by 20 patients. From those 20 patients 9 of those left a comment along with their rating. The overall rating for Dr. Rupal Kothari is 4.0 of 5.0 stars. Dr. Kothari gets 5 stars. Over many years I have had 5 colonoscopies and all with Dr. Kothari. Dr Kothari treated my daughter for several years for complex bowel problems. She was unfailingly caring, diligent in following up and researching additional treatments that might be of help. She was everything a physican should be! I would recommend her to anybody looking for an outstanding gasteroenterologist. Dr. Kothari is so nice, she answers my questions, she is the most thorough doctor I've had- sent me for all sorts of tests to ensure I didn't have inflamatory bowel disease when my first test came back inconclusive. She usually doesn't give you the results of your tests until the appointment after the test. She is big on prescheduling your next appointment, with me they were every four weeks and during those four weeks it was my job to get my referal and set up the test appointment with the other facilities. If she gives you a test order be prompt or you will be caught in the loop of rescheduling. She will settle your fears through evidence and her knowledge. She is more of a minimalist prescriber though so be aware of that. Her staff are nice and courteous. I have had a few issues though, once when I called the office to schedule an appointment the receptionist did not tell me which location the appointment was at, I ended up at the wrong office and had to call and inform them of the mistake, it was a simple misunderstanding. Their confirmation messages do tell you what location your appointment is at- but my phone had an error the day before the appointment and deleted all my messages so I never got to hear it. I can't honestly blame the office for that. Something to keep in mind especially if you have memory problems... Don't schedule an appointment on a Monday. I did once and the confirmation call came on Thursday. By the time my appointment came up I had already forgotten and missed the appointment. They have a one miss and dismiss rule, but let me slide with two because of the mix up the first time. I deal with several chronic illnesses that mess with my memory, but thankfully Dr. Kothari fixed me up what she could and the rest she informed me all she could give was a wastebasket diagnosis since thats where our medical knowledge of ibs is right now. Finally you should know the exton office has the weirdest freaking chairs for patients to sit in. I think theyre like refurbished dental chairs or gyno chairs or something. They are super awkard and the poor staff is always apologizing for them. Overall I really appreciate her as a Doctor, she healed me when I needed it and got me tests to ensure her diagnosis was correct. She was respectful and explained a lot when I had questions. She always asks "do you have any questions?" Several times during your appointments. Exceptional doctor. Truly cares about her patients. I went to see Dr. Kothari after being frustrated by my previous specialist. She listened to my complaints and explained my condition in details and formulated treatment plan. My condition has improved and I give her all the credit. Dr. Kothari was raised and educated in Philadelphia, Pennsylvania. She attended Temple University where she received a Bachelor of Science Degree in electrical engineering in 1992. She then received her medical degree and completed her residency in internal medicine at Philadelphia College of Osteopathic Medicine in 2000. In 2003 she completed her three-year fellowship in gastroenterology at Lankenau Hospital, a Thomas Jefferson affiliate. Dr. Kothari had been active in research and had numerous publications on such topics as esophageal motility, nutrition and colonic permeability, hepatitis C and colitis. 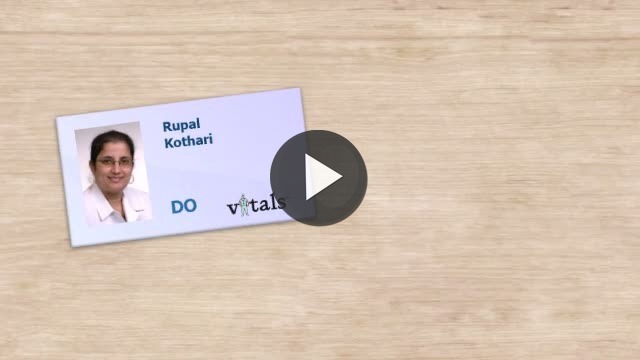 Take a minute to learn about Dr. Rupal Kothari, DO - Gastroenterology in Malvern, PA, in this video. Dr. Rupal Kothari is similar to the following 4 Doctors near Malvern, PA.
Have you had a recent visit with Dr. Rupal Kothari? Select a star to let us know how it was.